fusion | They point the finger at me.. again! This entry was posted in ADF, general and tagged ADF, doc, documentation, fusion, middleware on July 17, 2012 by vtkrishn. This entry was posted in SOA and tagged 11.1.1.3, deploy, ejb_ob_engine_wls.jar, error, exception, fmw, fusion, IOException, jdt, JDT compilation error, middleware, patchset, soa, soa 11.1.1.2, soa infra, SOA suite 11.1.1.2, SOA suite 11.1.1.3 on September 24, 2010 by vtkrishn. Fusion as the name describes is the collective integration of best of breed softwares to simplify business needs. 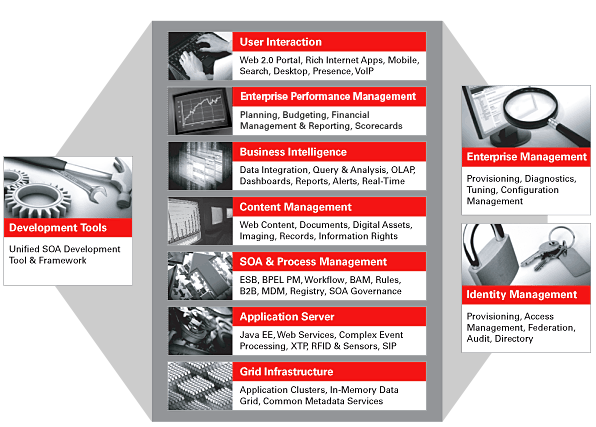 The revolutionary dream of Oracle claims to change the way we see business applications. and many more technologies from acquired products. This entry was posted in JDeveloper, webcenter, weblogic and tagged fusion, middleware on May 24, 2010 by vtkrishn.